A report posted July 17th, 2007, on a scientific forum has shown that in Brazilian waters, as many as 83 dolphins were killed in a single fish netting operation. This is part of the ongoing, and little documented, killing of dolphins by local fishermen in fisheries around the world. "We have just concluded a one-year monitoring program for incidental catches of small dolphins in the gillnet fishery operating off northern Brazil. Since August 2006, a total of 11 field trips were monitored onboard a fishing vessel operating off the coast of Amapa' State. The main target are 'pescada-amarela' and 'gurijuba', higly prized in the fish markets of Brazil. It was detected a large by-catch of dolphins, all of them Sotalia. Molecular analysis of a large sample set of Sotalia specimens were conducted at Fiocruz, Rio de Janeiro, Brazil. All specimens were identified as S. guianensis. Numbers of dolphins found entangled varied from one to 83 in a single boat operating off the northern Brazilian coast." 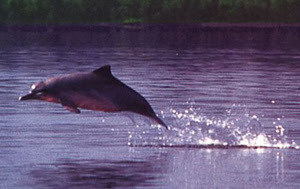 Sotalia dolphins are commonly known as the Tucuxi, an unusual dolphin, in that it can live in both salt and fresh water. It is sometimes seen as far inland as the foot of the Andes, 1,500 miles up the Amazon River. Its ocean range is from Nicaragua to southern Brazil. 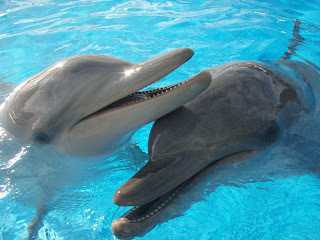 A small dolphin, it weighs from 75 to 100 pounds (35-45k), from 4.5 to 6 ft (1.3 to 1.8m) long. It is a beautiful, small, elegant dolphin, sometimes confused with Bottlenose Dolphin calves. Remember, dolphins are not under any form of direct international protection, such as the Whaling Moratorium of the International Whaling Commision, a UN supported organization. Only local, and international concern protects them. 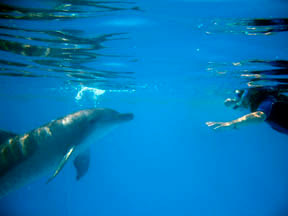 Our aim is to increase understanding of the world of the cetaceans. To achieve this, we will be posting a variety of items here. We will give you personal tales of our work and lives among the dolphins (and whales) in our area, and in our travels, as well as items from our ongoing research, collection of important facts from many sources not normally available to the general public, and more. We went over to see the dolphins yesterday afternoon. It was great to see them after having been away for a few weeks. Calamity is doing well with her "over the wall' move, from the small show pool, back into the big pool. She has been resistant for a while, after having felt discomfort going over the wall when pregnant. Now that Bella is two years old -- amazing, that she is already two! -- Calamity has decided it is not such a big deal. Bella goes over the wall easily, just a little flick of the tail and over she goes. Zip is fine, he came around for a bit of play. He loved Amanda's game, to take the ball and push it under water, letting it go so Zip can catch it on the way up. He likes the weird, upside down "bounce" it does, we think. He played long enough for Amanda's hands and arms to get quite cold, then wandered off to do his own thing, as usual. Buck came over right away, and played with us for quite a while. He loves to play catch. He brings a soggy old soccer ball over, one that has leaks, is half full of water and heavy. He gives it to you, you pick it up and toss it back to him. He only backs away about three feet, so the toss is short. He likes it when you toss it right into his mouth. After catching it he simply shoves it back across the water at you. He did this for about fifteen minutes. Part of our reason for the visit was to talk to the Manager about an upcoming event. We have been asked by Getaway (http://getaway.ninemsn.com.au/), Australian TV's leading travel show, to film our dolphin swim program, in the middle of next month. We were expecting this, as one of the women who came along last season for a swim spoke of her close friendship with the producer, and asked for information to forward to them. We are so excited by this! Stay tuned, we will keep you updated on that part of our on-going dolphin stories.